Who Is Jubel Perfect For? Jubel is perfect for adventurous travelers that want to easily plan a multi-destination experiential trip, that balances their needs and preferences as well as the ones of the people they are traveling with, all while staying on budget. We begin by selecting the perfect destinations for you. Whether that be introducing new and exciting places you may never even have considered, or tailoring a journey to please a large group of travelers, we’ll take into account each person’s individual preferences. Next, we’ll tackle all the fine details: the best methods of transportation, the “must-sees” in each location, maximizing your budget so you get the most bang for your buck, etc. This way, travelers won’t have to stress or waste time going in circles when planning and, once they’re on the ground, can focus on actually enjoying their trip. So, if you’re looking for an experiential trip - whether it’s a mind-opening immersion in a new culture, a hiking trip to a gem in your country, a foodie excursion to a far corner of the planet, a journey to meet new people in a different setting, or simply to disconnect and relax in nature - all while inspiring and feeding your sense of adventure, Jubel is perfect for you. Male, female, seasoned traveler, or newbie, taking a trip on your own is a thrilling, and sometimes scary, experience. Most solo travelers are looking to get out of their comfort zone and explore at their own pace, but figuring out an itinerary on your own can be a challenging process. Jubel helps you plan a personalized trip that you’re comfortable with and that also provides a meaningful experience that you can take home, as opposed to joining a group tour alongside loud teenagers on their gap year. As we tailor this journey to what you want most, you’ll be spending each day how you’d like, all the while feeling safe. 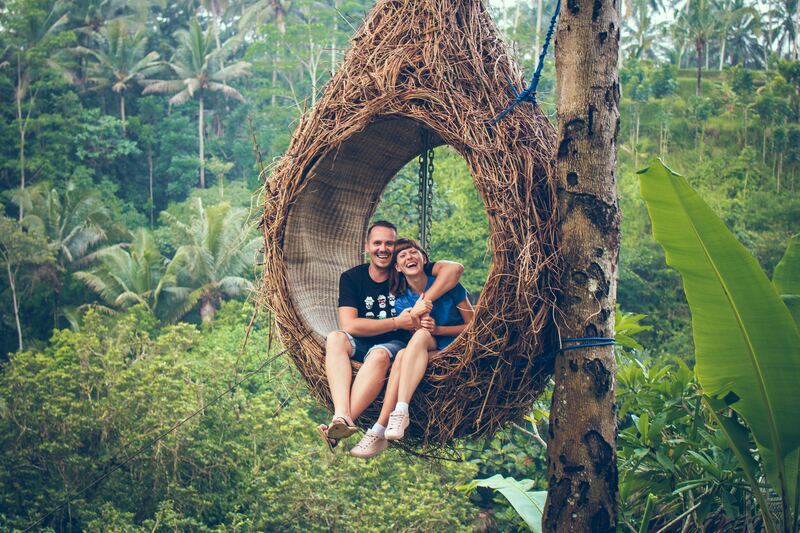 Traveling with your partner is the ultimate bonding experience. Be it an adventurous anniversary, honeymoon, surprise gift, or relaxing holiday, these are some of the most important trips you’ll ever take. Jubel allows couples to stop worrying (and oftentimes arguing) about the “where, what, and how” and helps them find new, special locations that will take their journey to the next level. We know that balancing differing opinions can be tough, especially when planning a trip. Let us do the legwork, keeping you and your partner on the same team, and finding interesting destinations and experiences that fit both of your interests, to ensure that you both get the most out of your journey. Fill your days discovering waterfalls in the jungle, enjoying a relaxing massage on the beach, or delighting in a romantic dinner at a world-class restaurant -- just the two of you. Graduation trips, bachelorette vacays, spa weekends or guys getaways, there’s nothing quite like traveling to exciting places with your closest friends. While fun times and non-stop laughter are the goal, it can be tricky to please and organize everyone in the group before departure. Jubel takes charge of all the organization, planning, payments (so everyone can chip in individually), and ultimately keeping everyone happy, so you can let the good times roll. Whether you spend your time kicked back on the beach, bonding on a challenging mountain trek, or partying ‘til sunrise, this is sure to be an unforgettable trip. Some of our earliest memories are made on family vacations - perhaps it was a summer stay at a lake house, a cozy mountain ski trip, or sightseeing in monumental cities. Wherever the destination, family trips are the definition of quality time. However, with different age groups comes different preferences, making it tough and time-consuming to plan a trip that everyone will love. 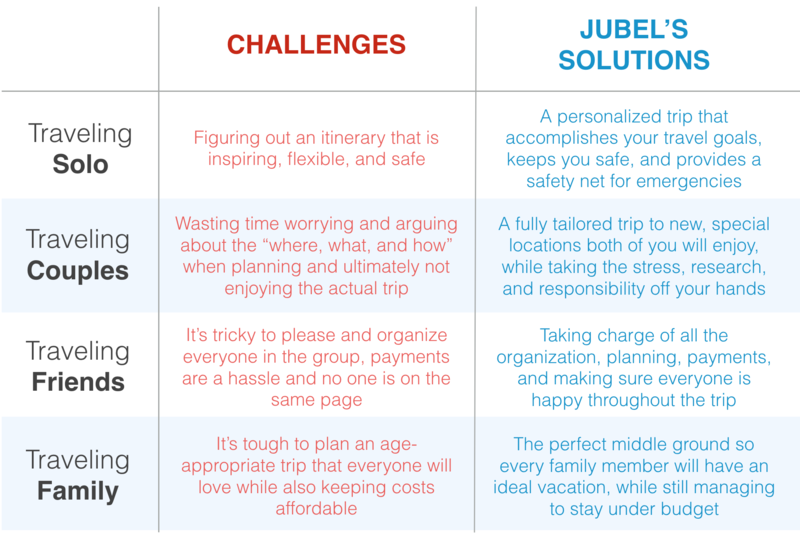 Jubel finds the perfect middle ground so that every member of your family will have the ideal vacation, while still managing to stay within your given budget. Imagine zip-lining through a jungle canopy, soaking in the local culture, and exploring hidden beaches. These are the memories that last a lifetime.